The new Asus ZenBook series offers machines in three sizes: 13, 14, and 15 inches. All three come with Intel’s 8th Gen Core series CPUs and solid-state storage. They also come with the option of dedicated graphics. Of the three variants, the first two come with Asus’ new innovation: the NumberPad, while the 15-inch variant comes with a traditional numpad. 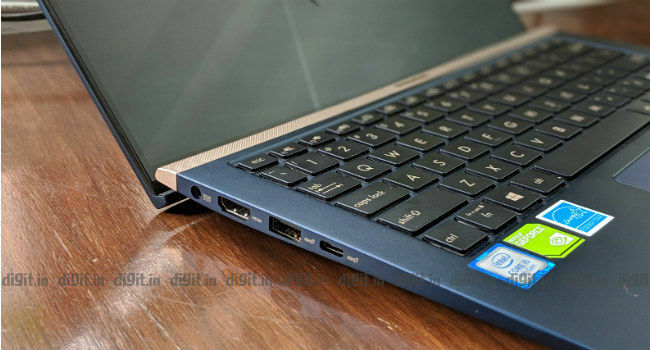 The NumberPad is essentially a backlit haptic numpad incorporated within the laptop’s touchpad and is what sets the new ZenBook series apart from the rest. 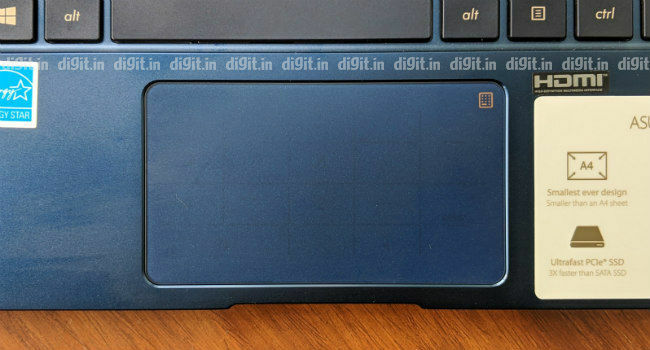 The touchpad can be used like any other precision touchpad even when the numpad is enabled. Does it work well though? That’s what we’re about to find out. 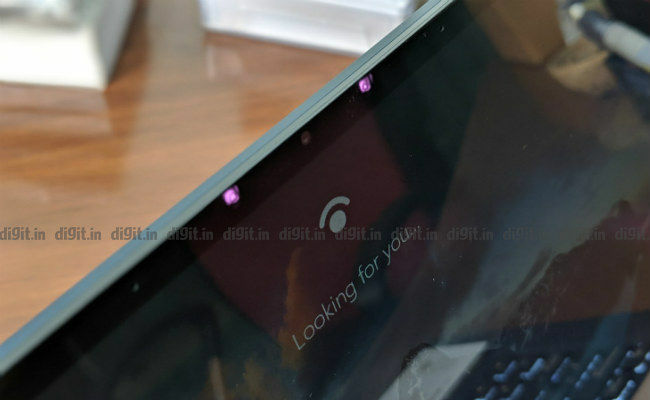 Read on to find out how Asus’ new Thin and Light fared in our tests. The build and design of the Asus ZenBook 13 is similar to that of the other models from the ZenBook line-up, which was terrific to begin with. 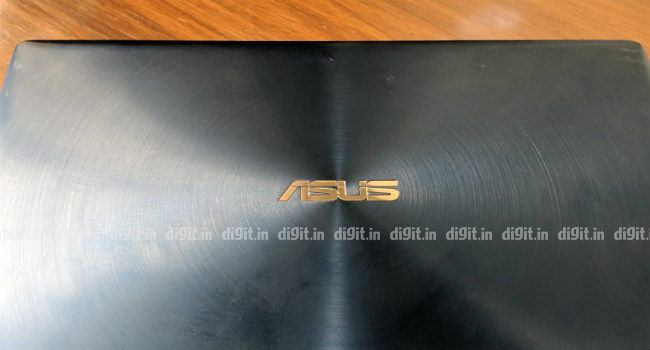 The top cover of the ZenBook 13 is made of spun-metal and has that concentric-circles design that’s unique to ZenBooks. The laptop feels grippy to hold and carry around. At the same time it looks classy enough to be spotted in the business class section of an aeroplane. Opening the lid of the ZenBook 13 with a single finger is an easy affair. As you open, the ErgoLift hinge gives the keyboard a three-degree tilt for easier typing. 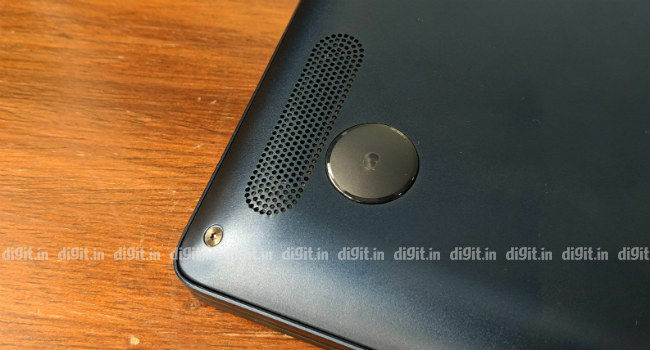 On the inside, you see a 13.3-inch display with very slim bezels. In fact, this ZenBook has the slimmest bezels I have seen on any laptop so far. They look so slim partly because the display is placed so close to the hinge. 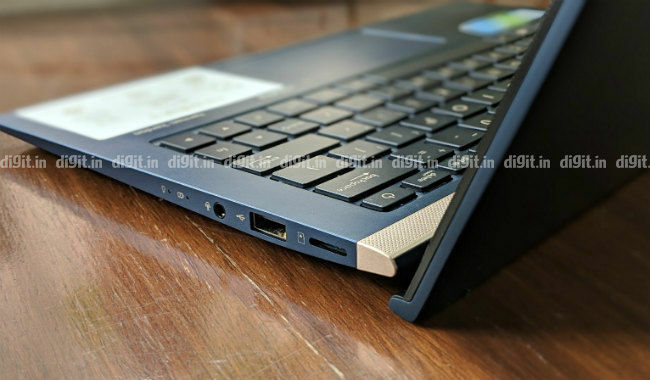 Above the keyboard is a dotted gold strip that runs along the edge of the laptop base to give the ZenBook an added touch of distinction. 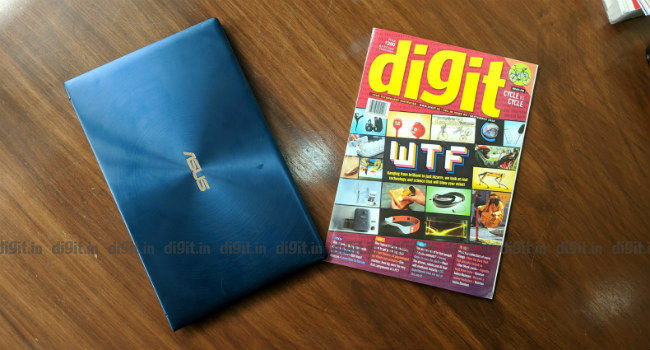 The ZenBook 13 may be smaller than an A4-size sheet but is not as slim. In fact, it's quite thick. It's what allows the laptop to house an NVIDIA GeForce MX150 graphics card and a full-size HDMI port. Despite that, the laptop is quite easy on the muscles as it weighs only 1.19 kilogrammes. I wish the display were touchscreen, especially because it looks like one; it's thick and glossy. The Asus ZenBook 13 is otherwise solidly built, and is significantly more compact than its predecessor. This one's definitely good to go for a life on the road. The new Asus ZenBook is available in three display sizes: 13.3 inches, 14 inches, and 15.6 inches. The 13.3-inch display on this ZenBook 13 has a Full HD resolution and a 95-percent screen-to-body ratio. According to our colour test, the display reproduces all the colours in the sRGB colour scale and 79 percent of the colours in the Adobe RGB colour scale. The maximum screen brightness is sufficient for working in indoor spots but not so much for airports and balconies. Nevertheless, the display works great for watching movies and browsing. It's worth noting that the ZenBook 13 and 14 are similar in length, width, and weight but differ only in their height. Because the ZenBook S and the ZenBook Flip S delivered such rich and loud audio, my expectations with the ZenBook 13 were set high—perhaps a bit too high. The two down-firing Harman Kardon-certified speakers on the ZenBook 13 deliver balanced sound but lack in loudness. Playing music in a buzzy corner of the office can be a challenge. That said, the sound output is balanced across lows, mids, and highs with almost no signs of distortion even when the volume is turned all the way up. In other words, if you and your colleagues gather around the little thirteen-incher to watch a short YouTube clip, you won't be disappointed. The Asus ZenBook 13 does not disappoint when it comes to connectivity. On the left side, you'll see the round-pin power port, a full-size HDMI port, a USB 3.1 Type-A port and a USB 3.1 Gen-2 Type-C port. On the right, you'll notice a microSD card reader, a USB 2.0 Type-A port, and a 3.5mm audio jack for headsets. This is a lot more than what its brethren, the ZenBook S and the ZenBook Flip S, offer. Sadly, the little fellow lacks Thunderbolt 3 support. The new Asus ZenBook series (including the ZenBook 13) have ditched the fingerprint scanner for a face unlock system, which, in my opinion, is not as effective. The Windows Hello-powered face unlock system on the ZenBook 13 requires you to look directly at the display during sign-in. If your face isn't completely aligned with the sensors, Windows gives up. Even if it is, the authentication succeeds only say, three out of five times. Asus could've thrown in the good old fingerprint reader and kept it simple. I have mixed feelings about the keyboard on the Asus ZenBook 13. I like the travel and the feeling the three-stage backlit keys offer but don't like the size of the keycaps. They're a touch too small for comfortable typing. Still, they're comfortable enough for emails and short documents. I wish the power button weren't placed adjacent to the Delete key on the keyboard as it's capable of causing a few unexpected shutdowns. I also wish Asus had gifted the keyboard with dedicated keys for Home, End, Page Up, and Page Down functions. The touchpad on the Asus ZenBook 13 is no regular one. Asus has cleverly integrated a capacitive touch-based numpad into the matte-finish touchpad that can be activated or deactivated with the press of a haptic button on the top right corner of the touchpad. The touchpad uses Windows 10's precision drivers at the very core to operate. So that means multi-touch swipes and taps are easy to use and customise. Though the touchpad is designed to be used normally even when the NumberPad is enabled, the pointer strays often and makes clicks a pain. Asus should be able to sort out glitches like this with a software update. Though Asus' NumberPad is a novel feature, I can't say it's very practical. One must consciously remember to turn it on and use it for number entry instead of the usual number row on the keyboard, which is faster for small entries. What's more, the capacitive touch keys on the NumberPad don't offer the same tactile feeling as physical ones. 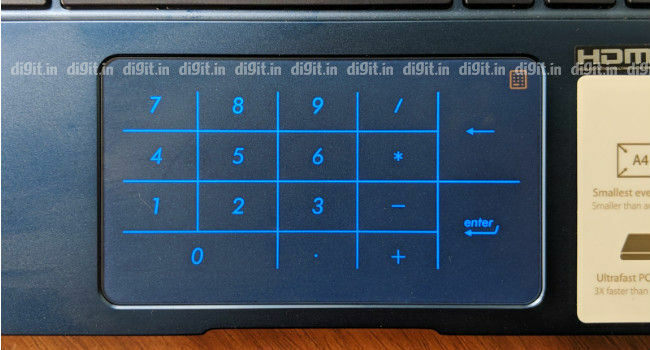 Given how the market has plenty of wired and wireless numpads on offer for as little as three hundred rupees, the NumberPad isn't exactly a must-have on your next laptop. The Asus ZenBook 13 is powered by an 8th Gen Intel Core i5-8265U CPU and a sufficient 8GB of RAM. Storage is taken care of by a 512GB Western Digital PCIe-based solid-state drive. Graphics are rendered by a dedicated NVIDIA GeForce MX150 graphics card. 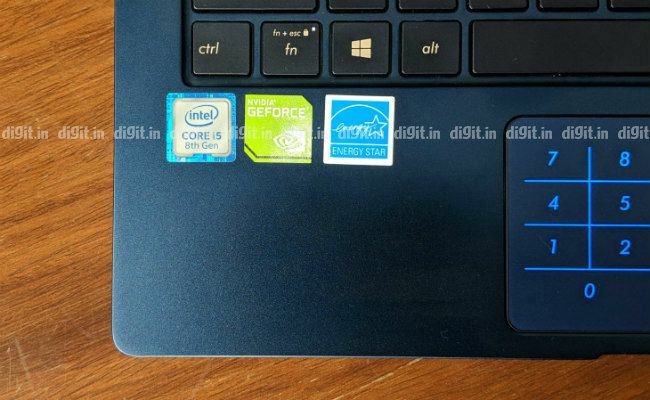 All this grants the ZenBook 13 good scores on our benchmark tests. 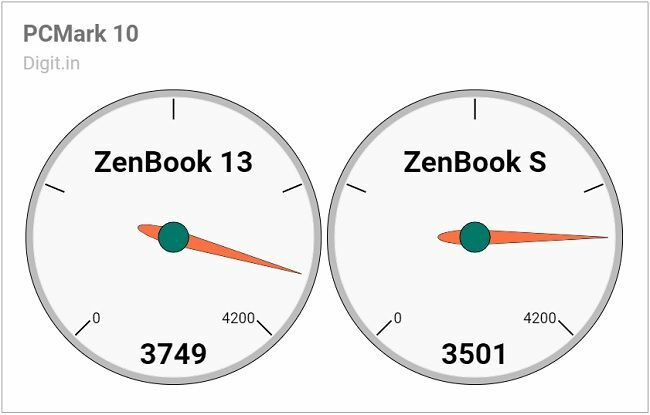 The ZenBook 13 outpaces its more expensive brother, the ZenBook S, in PCMark 10 by 248 points. It leaves all other Thin and Light laptops biting the dust in graphics benchmark tests, thanks to the NVIDIA chip inside. In the real world, the ZenBook 13 displays a great amount of speed during everyday activities like browsing, writing, and video-watching. Switching between numerous applications on multiple virtual desktops happens without even a single lag or stutter. Window animations happen without any stutter or tearing. With 2GB of dedicated vRAM coming from the NVIDIA card, the ZenBook 13 feels comfortable with some light image editing work and even some gaming. The review unit of the Asus ZenBook 13 ran Doom at around 20 frames per second on Ultra settings in Full HD resolution, which isn't shabby. The frame rate rose by 10 frames per second when the graphics settings was kicked down to Medium. It ran Metro: Last Light at an average of 7 frames per second regardless of the graphics settings, rendering the game altogether unplayable. 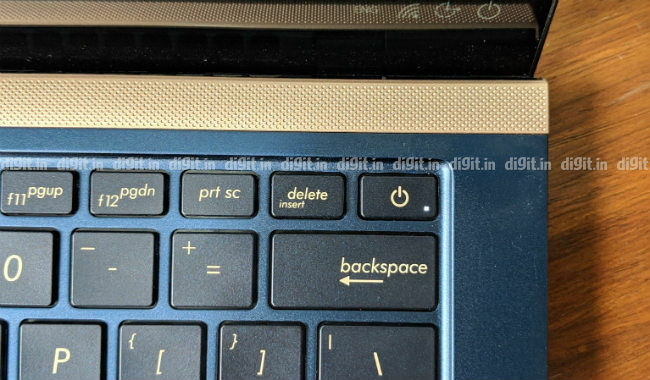 The heat on base and the keyboard area of the ZenBook 13 was hardly felt even though the package temperature rose to nearly 70 degrees Celsius from time to time. The battery on the ZenBook 13 review unit was strong enough to keep the laptop alive for 5 hours, 20 minutes on our standard battery benchmark test, which is quite a decent score. When I used it for writing, browsing, and music playback, the battery fell from full charge to 60 percent in three hours. During that time, the screen brightness was set to 60 percent, and Wi-Fi and Bluetooth were turned on. Charging from around 30 percent to 100 happened in less than one and a half hours. In summary, the ZenBook 13 will last you between six and seven hours if you aren't demanding too many tasks of it. Considering the laptop costs Rs 88,990, that's pretty good. With its really compact body and capable powertrain, the Asus ZenBook 13 competes with the likes of the Lenovo IdeaPad 530S and the HP Spectre x360. It's more compact than both the models, even if it's slightly thicker. 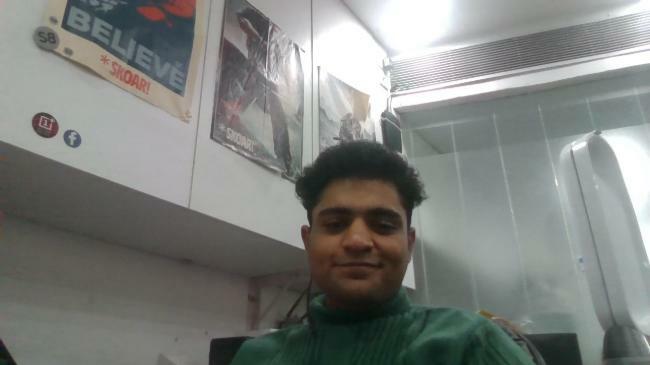 Its display has more colours, which makes it naturally better for image editing work. The NumberPad gives it an edge too, for those who really want a haptic numpad. All things considered, the Asus ZenBook 13 is a Thin and Light laptop worth considering if you're seeking both power and portability in one package, especially if you work quite a bit with images. The price may be on the higher side but one gaze into that Full HD display will make you want to get it anyway.